HONG KONG - Mrs Carrie Lam won the election on Sunday (March 26) to become Hong Kong's first female chief executive, pledging to build unity in a politically divided city. The 59-year-old pro-Beijing candidate won 777 votes, ahead of former financial chief John Tsang, 65, who had 365 votes, and retired judge Woo Kwok Hing, 70, with only 21 votes. There were four invalid votes. Mrs Lam, who quit as Hong Kong's former no. 2 official in January in order to run in the election, will govern the city for five years from July 1, taking over from Mr Leung Chun Ying. "Hong Kong, our home, is suffering from quite serious divisiveness and has accumulated a lot of frustration. My priority will be to heal the divide and to ease the frustration – and to unite our society to move forward," Mrs Lam said at a press conference after her victory. "At the start of this campaign, I felt rather confident that years of public service meant I should know things reasonably well. In the process, however, I... learnt and experienced many new things... I see my shortcomings and understand that I must put in more efforts,'' she said. "I also understand that being the Chief Executive will be very different from all the other positions in which I have previously served. In those positions, my role tended towards implementing solutions to problems. As Chief Executive, it will be my responsibility to identify the crux of the matter and address the problem with a more macro approach," she told reporters. Mr Leung congratulated Mrs Lam after her election victory, saying he and his government will ensure a seamless transition and "fully support the preparation for forming the new term of government". The head of the Liaison Office in the Hong Kong also congratulated Mrs Lam on her win. Sunday's election came amid protests against a "small-circle election" where only 1,194 members of an election committee were tasked to pick the city's top leader. Before voting started at 9am, pro-democracy activists protested outside the polling centre in Wan Chai and demanded universal suffrage and rights to pick the city's chief executive. Mrs Lam, who served as Chief Secretary until her resignation in January, was widely seen as Beijing's preferred candidate. In the days leading up to polling day, she came under much criticism after several local media outlets reported that National People's Congress chairman Zhang Dejiang and the Hong Kong and Macau Affairs Office had reminded the Election Committee that she was the central government's sole preferred candidate. That raised concern that Beijing was interfering in the city's election. On Sunday, pro-Beijing newspaper Ta Kung Pao published Mrs Lam's photo on its front page with the headline "Vote for Carrie Lam". A celebratory carnival has also been planned for Sunday afternoon where cookies with Mrs Lam's face printed on the packaging will be distributed. Mr Tsang, the city's former financial chief, was seen as the underdog who did not have the full trust of Beijing. Despite being publicly criticised by pro-Beijing figures for his laid-back work style and propensity to avoid politically-sensitive issues, he received the highest public support ratings. Two days before polling day, some 3,500 people turned up for his rally to show their support for him. Mr Tsang had hoped the mass turnout would convince election committee members to cast their votes for him in the secret ballot on Sunday. But that was not the case. Sunday's election was held against a backdrop of a highly divided society where residents fear the creeping interference of China is eroding the city's autonomy over time. When Hong Kong was returned to China in 1997, the central government had promised Hong Kongers a high degree of autonomy for the city, which would be governed under a "one country, two systems" framework. Beijing had also pledged to let Hong Kongers vote for their own leader. 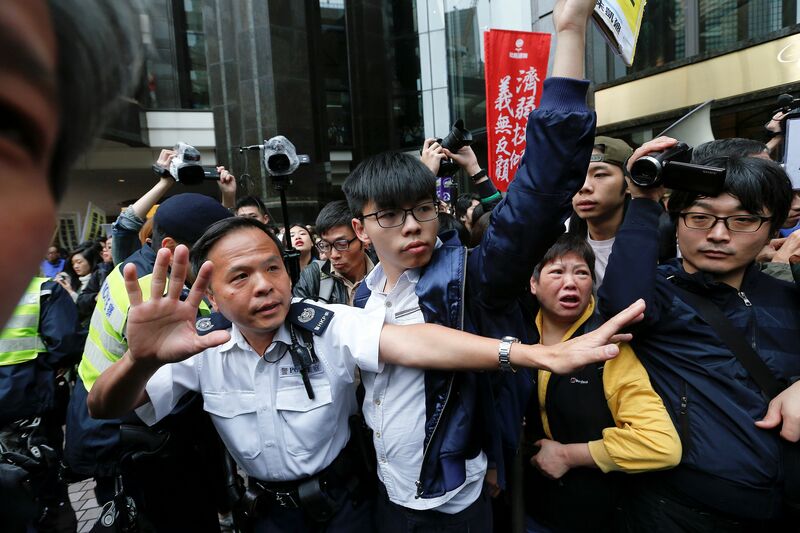 The newly-elected Mrs Lam will face the challenge of balancing the demands of Beijing and growing calls for democracy in Hong Kong, as seen by violent street protests and direct challenges to Beijing's authority by localist lawmakers in the Legislative Council (Legco), said analysts. During her election campaign, Mrs Lam promised to introduce a new style of governance heavy on public engagement and to involve the city's youths in the discussion and formulation of government policies. In 2014, when she was Chief Secretary, Mrs Lam failed to push for a political reform package that would see candidates for chief executive being vetted by a pro-Beijing committee before giving Hong Kongers the right to elect their leader. The controversial package led thousands of students to camp out in the streets for 79 days to demand a freer election.